Experian Hitwise announced today that Google accounted for 71.65 percent of all U.S. searches conducted in the four weeks ending June 26, 2010. Yahoo! Search, Bing and Ask received 14.37 percent, 9.85 percent and 2.19 percent, respectively. The remaining 70 search engines in the Hitwise Search Engine Analysis Tool accounted for 1.94 percent of U.S. searches. While Google continues to be the greatest source of traffic to key U.S. industries, Bing saw continued growth to verticals! 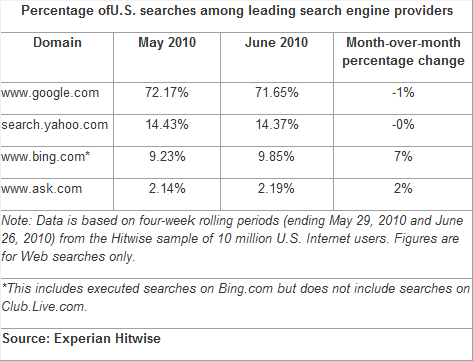 In Canada, Google received 77.13% of share of searches for 12 weeks ending 6/26/2010 followed by Bing at No. 2 position w/6.43%, reports Hitwise. The reason, I bet, being that so many people are now upgrading to Win7… Many 4get, or are not bothered to change the default search engine which is set to Bing..